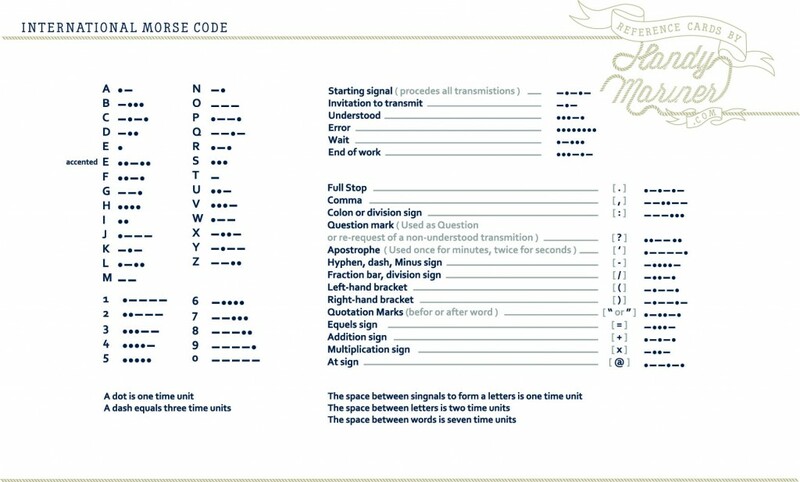 Morse Code is a communication method developed by Samuel F. B. Morse which uses a series of clicks, sounds or light flashes to transmit information. Morse starting playing around in 1836 with several co-workers using electromagnets to transmit information through pulses and silences. Their first telegraphy system got put to good use in 1844 which made indentations into paper led by electromagnetic pulses. The Morse Code was developed so that operators could translate this dented paper into actual text. Even after 160 years Morse Code is still an important method of communication. It is still usable in bad reception, much better than radio, which makes it come in handy especially for marine purposes. Whether used as the original electromagnetic pulses or created with light flashes to signal other boats, Morse Code is still used as a communication method and could one day save your life. For starters, there are 4 elements to Morse Code that you’ll need to form a sentence. Each letter of the alphabet has his own code of dots and dashes. These were assigned to letters according to the how frequently they are used in the English language. For example the letter E gets used the most and contains a single dot, the letter Q gets used a lot less so it’s code is longer and finally number have the longest codes as Morse Code is generally used for text.